All the above materials can be found on the SAP market place and help you clear the test with a good grade! 1.Modelling is the largest Part.I had 27 questions (total: 80) of this part. Please be sure to read attribute, analytical view and view calculation again and again that the most sensitive issues are these. 2.Reporting is the second largest. There is a graph showing various connectivity options JDBC, ODBC, ODBO, MDX, BICS. There will be a good chunk of questions around these.Also features BO Explorer, analysis, Crystal Reports there.These will be easier to answer if we crossed the document.Those with a working knowledge of the soundtrack will breeze through responses. Provisioning is the third 3.Data important.Most easy questions are found in this section. BODS and some different methods of data provisioning.Pay attention to the advantages and disadvantages of all the methods that are as real-time, etc. Also, make sure that you study all the data flows on what happens when. 4. There will be 6-8 issues security.Please try to get their hands on TZH300 for that.You should know all the privileges and roles in SAP HANA. 5.There is a diagram related to architecture. Make sure we know by heart because there are direct questions there.Also issues persistence layer will be simple. 6.I suggests that the answer to those that you are confident about a flag go.Just those doubtful.You can return again and again to check your questions. Once you have reviewed all three times you will be able to answer most of them. Just pay attention to issues more than one correct answer. Deleted HANA Certification on 08/03/2012 with 95% marks ... Some tips on preparing! 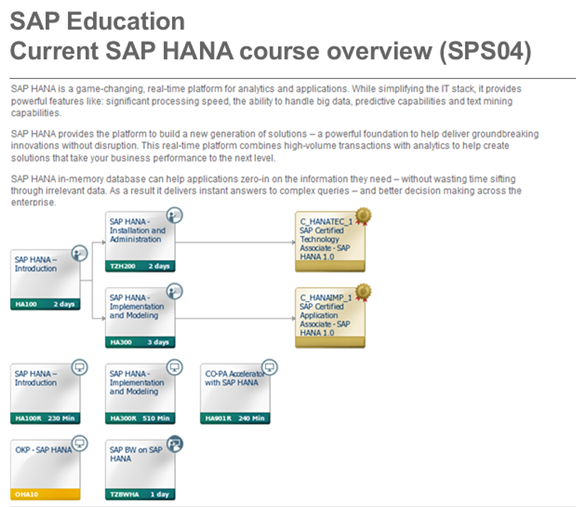 1) I have many years of SAP BW and I felt that this background has helped me to easily understand the concepts of modeling HANA experience. 2) I did not go through training, but read a lot of material that I have listed below (preparation time = 10 weeks ~ 3 hours per day). 4) So my recommendation is to go through TZHANA, understand all the concepts and then go through the rest of the documentation that I have listed below for more specific information. 7) Finally, but most importantly, make sure that you get some hands on experience with the system when reading through TZHANA, TZH300. There will be some certfication questions can not be answered by previous hands on experience. This experience does not have to come to work at a customer location. I opened an account with Amazon Cloud Share (Amazon Web Services) and I thought it was the easiest way / economical to get your hands on a HANA system. If you are comfortable with the documents listed above, I am + ve that you can easily clear the certification exam. My only recommendation is to understand the concepts just remember the answers that would help considerably in actual implementations in the future. Good luck!